In the latest cold snap happening around the country, temperatures have dropped 10-35 degrees below average. It makes you want to shiver just reading about it. Weeks like this make it easy to understand why home heating is a major expense, especially in cold climates. According to the U.S. Department of Energy, space heating is the largest home energy expense, accounting for 45 percent of monthly energy bills. The way you heat your home will have a major impact on how much you pay to stay warm. Choosing your home’s most cost effective heating system will depend on your budget, the availability of fuel types in your area, and your personal preferences. You’ll need to decide on the fuel that creates your heat (common choices are oil, natural gas, electricity, propane and even wood), and from there you’ll need to determine how you want the heat delivered throughout your home. Two common choices are a forced air heating system and radiant heat — but do you know the key pros and cons of each one? Here is our cheat sheet on both to help you decide between underfloor heating or central air. A forced air heating system simply refers to units that use air to carry warmth throughout a space. Homes with central heating and built-in duct work often use this system. The furnace is typically located in the center of the home or in the basement. Common forced heating models burn natural gas to produce a flame that heats the air, which is then distributed throughout the house. You can purchase electric furnaces as well. Pros: Central forced air heating systems move air about the house to promote circulation. Heat rises, leaving the basement and floors cold in the house. So if you need to have your basement warm for the weekend, or just your bedroom cozy at night, you need to run the furnace and heat the whole house. If your home does not have air ducts, you need to have them installed to use a forced air system or central heating system. Installing the components for a split system can also be costly and maintenance can be just as bad if you have to replace something like a condensing coil in any of your air conditioning units. And finally, transferring heat through the air isn't as energy efficient as other options. Radiant floor heating warms a surface directly by relying on touch to transfer energy. The heat is produced by electricity, hot water or air that makes direct contact with the surface on which you choose to install your system. That heat is then transferred to people and objects in the room via infrared radiation. In most cases, these systems are installed beneath flooring (although there are a few other radiant options like baseboard heaters). 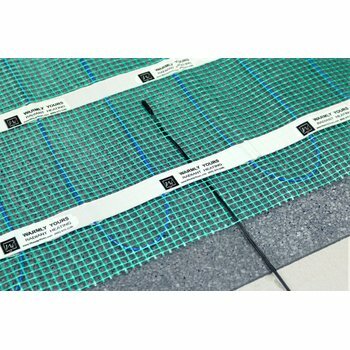 Here's a video showing the installation of floor heating in an uncoupling membrane in a bathroom with tile as the floor covering. Pros: Radiant heat eliminates the inefficient heat loss created by rising heat, as warmth is not distributed through the air. These systems are allergy-friendly, while forced air pushes allergens throughout the house. In addition, you can adjust the heat level for individual rooms to the level that you want with a programmable thermostat. Not only does this allow you to have the ability to customize your comfort room-by-room, but it also translates into significant energy savings. After all, there's no need to heat the basement all day long if you are not using it. Cons: Radiant heating is installed beneath the floor, making it harder to access for repairs or maintenance. However, electric floor heating requires almost no maintenance and with the troubleshooting tools and expertise available from WarmlyYours, the repair process isn't nearly as daunting as it once was. A common concern is how do the systems compare when considering radiant heat vs forced air cost. Radiant heating is the more efficient system so operating costs will be lower and the material costs are very affordable. In addition, the installation cost is very cost effective, usually priced between $3.75 to $5.75 per sq. ft. depending on the size of the room. This is just an estimate and we suggest you contact your local trade professional for specific costs in your area. This type of topic can be broken down in any number of ways like "floor heating vs central" or "baseboard heating vs forced air", but it all boils down to this: Although forced air heating systems are a common method for heating a home, continuing developments in radiant heat systems continue to make this a more popular option because they're typically more efficient and cost effective than forced air. It’s hard to argue with an allergy-reducing, efficient, breezeless, quiet option for heating your home, improving your air quality, and protecting your pocketbook — at least we’d like to think so here at WarmlyYours Radiant Heating. Are you curious about whether or not radiant floor heating can be the primary heat source in your room or project? Find out by using the free WarmlyYours Heat Loss Calculator tool. If you're curious about how much a floor warming system will cost to run in your area, use our Operating Cost Calculator. 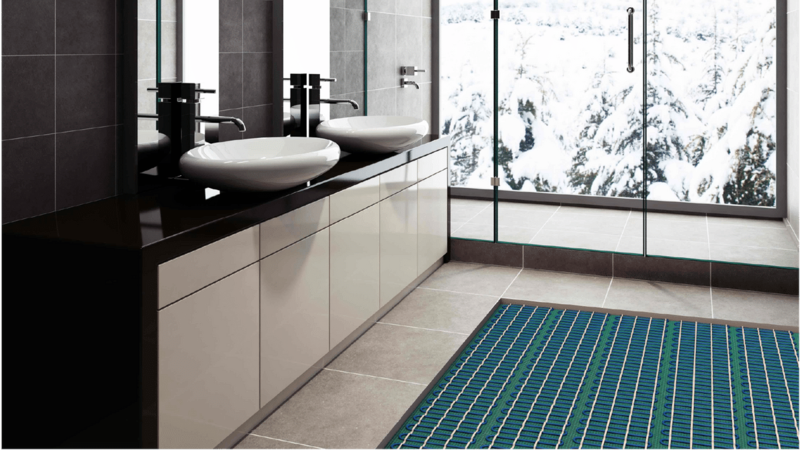 Learn more about the types of radiant floor heating products like electric floor heating systems! Thanks for the question. The most efficient heating system for the project you’ve described would be electric radiant floor heating. By embedding the heat-source in your floor, you’ll take advantage of heat’s natural tendency to rise—while minimizing heat loss due to dissipation. Our radiant panels are also a great heating-element option if you’re not planning on replacing your floor. How much would it cost to have radiant heating in a 2600 sq ft house? How much would forced air be? Thanks for the question. 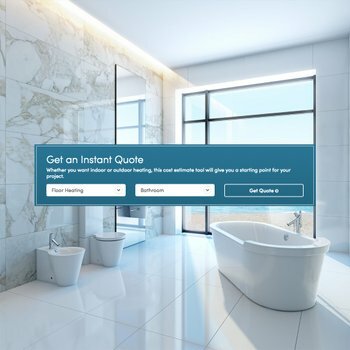 We’d need more information about your project, like the flooring types to be used and the number of rooms in the home, to give you an accurate estimate—but you can always use our free Instant Quote Tool (on our homepage and under the “Services” tab) to generate a quick room-by-room estimate. 1300 sq.ft. home Electric Radiant Ceiling Heat vs. Gas forced Air furnace. How much of a price difference would you expect to see on your Heat bill? How much savings is in the Radiant Ceiling heat? 10%, 25% ?? So we are looking to get a home, built in 1967 has ceiling radiant heat. How does this house breathe as compared to a home with forced air? mdl1doc@gmail.com Thanks. Radiant ceiling heat, like radiant floor heating, is an exceptionally efficient form of heating because it heats the objects in a room (instead of just the air). According to Tom Tesmar, from Tesmar Application Technology, with radiant ceiling heat, the heat will radiate from your heating system into all the solid surfaces in a room, not unlike heat from the sun. Generally speaking, this efficiency tends to mean lower heating bills. However, there are three main variables you’ll need to know to estimate the actual effect such a system would have on your heating costs: 1.) The operating cost for running the system. 2.) Its heat output. 3.) How much heat-loss your home has. Thank you for the question! This is a question we get quite a bit. The type of radiant heat provided from electric floor heating is not dangerous at all, in fact, it's actually healthier than forced air systems because it doesn't unnecessarily circulate allergens and dust particulates. The term "radiant" is just used as a way to separate this heating from "convection" heating (a.k.a forced air). In radiant heating, the heat source "radiates" the heat directly to other solid objects instead of traveling via air, which is very efficient. Certain electro-magnetic fields (EMF), generated by high-voltage systems like industrial power lines, can be harmful, but our floor heating systems are ultra-low EMF, which means they generate less EMF than a regular vacuum cleaner. I'm buying a home that has awindow unit for air. 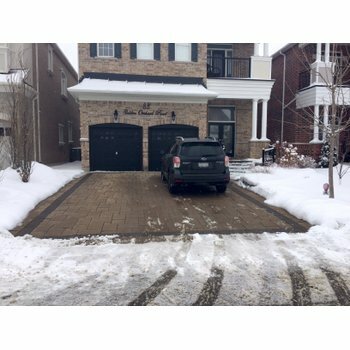 looking into getting central air for heating as well, what should i do? the property has 3 rooms and 2 baths and about 1,700 sq ft.
Gustavo, thanks for reading and congrats on the new home! If you're curious about whether or not radiant floor heating might be a good fit for your project, please feel free to give us a call at 1-800-875-5285. Andrew, that's a good question--but it's also one that is dependent on a lot of variables. Depending on where you live, it will have an impact on two things: 1.) the average temperature 2.) the cost of electricity/gas. If you live in a very cold climate, it may make sense to invest in the higher upfront costs of a gas furnace. The gas furnace will be cheaper to operate but it won't last as long as the electric one. However, you may want to consider supplementing which ever option you choose with electric floor heating. Since the heat comes from the floor, it has the highest level of efficiency (as the heat simply rises). Hope that helps. If you have further questions, don't hesitate to give us a call at 1-800-875-5285 or chat us using the icon at the bottom right of your screen. I've spent much of my military time overseas and admire the European heating system that is quiet, allergy-free, and not noisy---flat, small radiators against the wall. Old American houses have ugly big radiators but the ones I saw in England were modern, efficient, and quiet. Why haven't we in the U.S. used that system instead of the noisy, inefficient forced air system? Bob, thanks for reading and for your contribution to the discussion! Regarding your question, I think the biggest reason radiant heating is the exception and not the norm is that people don't know much about it. They grew up with forced air heating But every day, more and more people are learning about the many benefits of radiant heating. Thanks again for your question. Garry, thanks for the question! To give you an accurate answer, we'll need to know some additional information like the energy cost in your area, the level of heat loss your shop experiences, and your current bill totals. One of our account reps will reach out to hopefully help you get the answer you need but in the meantime, I'd suggest checking out our Operating Cost Calculator:https://www.warmlyyours.com/tools/cost-calculators By just entering some basic information, you can get an idea of how much it would cost to run a system in your area. Hope that helps! Earl, that's a great question. Our Heat Loss Calculator tool (available in the "Tools" tab in the main menu) will help identify the potential heat loss for your project and also provide an estimation of how much heat a supplemental floor heating system could provide. From there, you could work with your WarmlyYours account manager (or give us a call at 1-800-875-5285) to identify how much additional heat would need to be provided by a forced air system to achieve the perfect balance for your home. I have an area in a building that I want to generate more heat. Currenlty there is a reznor hanging heater that needs to be replaced. Am I better off replacing with the same forced air type, or an overhead radiant heat tube. I have this in another area of the building and feel it is a more effective way to add head to the space, however a heating and cooling contractor is saying another reznor forced air type is better. Todd, that's a very interesting question. We're primarily radiant floor heating experts so, of course, we'd recommend that you explore that as an option. Electric floor heating can be a very simple and effective way of adding supplemental heat to a room. If you have any questions about that, feel free to call us (1-800-875-5285) and we can discuss it. Getting back to your question: there are certainly variables to consider, like heat output from each system, but between the two options you outlined, we'd have to recommend that you follow the HVAC contractor's advice about getting another reznor forced air heater. The overhead radiant heat tube will most likely require a boiler, valves, tubing, a specialist installer, along with other fittings and controls. Even if you're just adding to an existing system it'll probably be a very complex and expensive project. Hope that helps!